A 29-year-old woman with past medical history of hypertension was referred to our hospital for the evaluation of kidney dysfunction (serum creatinine 1.0 mg/dL), proteinuria (0.54 g/gCre), and microscopic hematuria. Renal biopsy before the first pregnancy was supportive for benign nephrosclerosis with no evidence of vasculitis. After her second pregnancy and delivery when she was 32 years old, she developed proteinuria of 3.2 g/gCre, hematuria, and elevated serum creatinine level of 2.6 mg/dL. Second renal biopsy revealed necrotizing glomerulonephritis and her serum MPO-ANCA was positive, leading to the diagnosis of MPA/renal-limited vasculitis (RLV). Interestingly, frozen preserved serum from 4 years earlier also tested positive for MPO-ANCA. 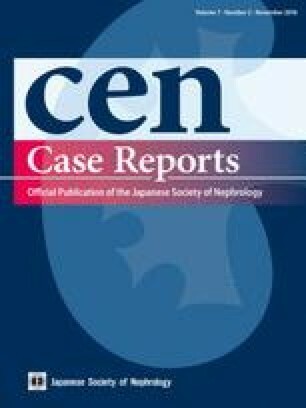 Despite intensive treatment, hemodialysis was required 10 years later due to progressive deterioration of renal function. At that time, she developed pericarditis, bloody cardiac tamponade, and pulmonary alveolar hemorrhage, resulting in a diagnosis of systemic vasculitis MPA. She received living donor kidney transplantation at the age of 44 years, after which serum creatinine has been stable around 1.1 mg/dL without proteinuria or hematuria and MPO-ANCA has remained negative. The association of vasculitis with pregnancy and delivery is not well documented, especially in patients with MPA. Here, we report this MPO-ANCA positive woman developing MPA necrotizing glomerulonephritis after her second pregnancy and a 20-year clinical course. All the authors have declared no competing interest. Informed consent was obtained from this patient.